Hair growth is just one of the many physical changes women experience during pregnancy. During pregnancy, most women’s hair looks thicker, fuller, and healthier. However, a few months after the baby is born, around half of all new moms will experience significant hair loss, usually while they’re still breastfeeding. The timing of this postpartum hair loss has led many new moms to believe that breastfeeding causes hair loss. It’s time to get the facts on breastfeeding and postpartum hair loss once and for all. Does breastfeeding cause hair loss? Keep reading to find out! Estrogen is a female hormone produced in the ovaries. Estrogen levels rise and fall throughout a woman’s life, but levels reach their all-time high during pregnancy. These high estrogen levels have a positive impact on hair by lengthening hair’s natural growth phase (anagen phase) and preventing hair from entering the shedding phase (exogen phase). 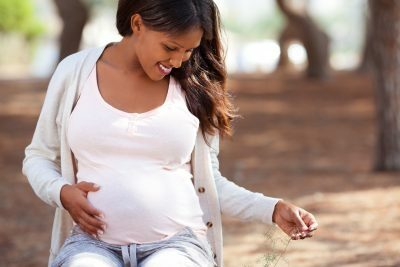 As a result, pregnancy leads to thicker, healthier-looking hair. After the baby’s birth, estrogen levels drop and levels of a stress hormone called cortisol rise. These hormonal fluctuations cause many hair follicles to switch to the shedding phase of the hair cycle all around the same time. Nine weeks after birth, around 30% of hair is shed. 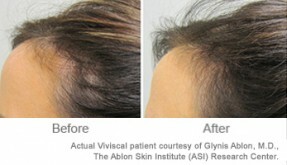 Telogen effluvium is the general name for any temporary hair thinning, like this type of excessive postpartum hair loss. According to the American Pregnancy Association, telogen effluvium affects around half of all new moms. 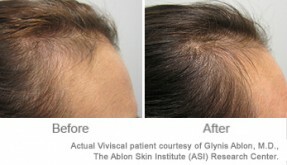 During telogen effluvium, most or all of the excess hair retained during pregnancy falls out. 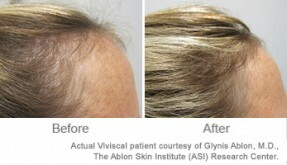 The hair will regrow, however, as hormone levels and the hair growth cycle return to normal. Does Breastfeeding Cause Hair Loss? Breastfeeding does not cause hair loss. 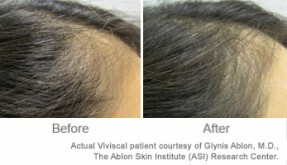 Postpartum telogen effluvium tends to occur during the same time that many new moms are breastfeeding, which has led to belief that breastfeeding causes hair loss. However, breastfeeding has no proven effect on whether or not a woman will lose her hair after giving birth. Avoid using heat tools on hair. High heat damages the protective cuticle layer of the hair strand, resulting in dry, brittle hair. Embrace your natural texture and allow hair to air-dry whenever possible. Bonus: skipping the heat-styling also will save you time, something all new moms need! Use a gentle shampoo like Viviscal Gorgeous Growth Densifying Shampoo to cleanse the hair and scalp without stripping away vital natural oils. When washing hair, gently massage the scalp to stimulate blood flow, which will help bring more nutrients and oxygen to hair follicles. Always follow shampoo with conditioner. A high-quality conditioner like Viviscal Gorgeous Growth Densifying Conditioner adds strengthening nutrients and moisture to parched hair, keeping it looking healthy and strong. Sleep on a satin or silk pillowcase to prevent tangles, frizz and dryness. At night, cotton pillowcases absorb hair’s natural moisture, making hair more dry and prone to breakage. Silk and satin pillowcases allow hair to retain its natural hydration, and since they also have more slip, they minimize friction and reduce overnight tangles. Don’t wear the same hairstyle every day. While it can be tempting for busy new moms to simply toss hair back in a ponytail, wearing the same hairstyle frequently can cause breakage and thinning. Ponytail holders place stress on the hair shaft. 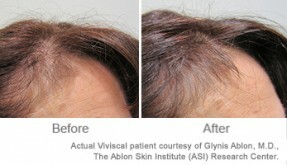 After a while, this repeated stress can break the hairs and create the appearance of thinning. Use a wider variety of hairstyles like loose braids, buns and ponytails to prevent this sort of damage and minimize the stress to any one area of your hair. Remember: hair loss after pregnancy is totally normal. 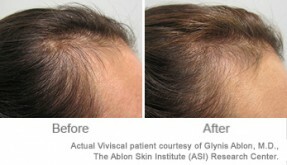 In most cases, after postpartum hair loss, your hair will return to its pre-pregnancy thickness and health. To maximize your hair growth, post-breastfeeding, add Viviscal Hair Supplements to your daily routine. Just one pill, two times a day, provides your body with the vitamins and minerals it needs to grow thicker hair after pregnancy. * Tip: we recommend waiting until you’re no longer pregnant or breastfeeding to start Viviscal because it contains marine extracts. And of course, if you have questions about taking any new supplement or medication, check with your OB/GYN or pediatrician. With a few simple steps and a little patience, your postpartum hair will be back to its prepartum state in no time!